Here, let me get you that ladder…..
…so you can climb down off of your own back!! It feels a little weird to be Sunday, and I’m not running double-digit miles…somewhere. But it didn’t take me long to settle into my convalescence. Nursing my foot and my alternate ankle — well, it’s just necessary. So Sunday, this week, was a day of rest — where I could sit back and focus on the Lesson Of the Week. And yes, the Lesson most certainly is — Geez Louse….you are H.A.R.D. on yourself Diane!!! So I’m offering this message out to my little world today. 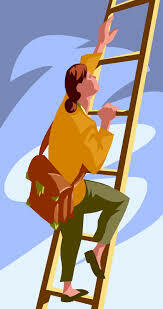 Use this gift of this Sunday, to borrow my ladder…and climb down. Climb down my lovely friend Ivy. Climb down Brian from my WW back row. I promise — It’ll be the BIGGEST, most PROFOUND weight loss of your life!